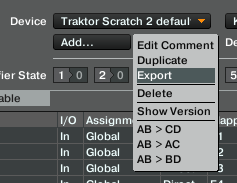 With so many options available to us for control methods of Traktor, I can imagine that unless you are using the standard controllers with the included standard tsi files, then there isn’t 2 people out there with the exact same controller settings. This is the beauty of Traktor; the individuality that it can provide all of the DJ’s using the software. Since the industry has moved on from the simplest raw art form of turntablism, we have been introduced to a new era of DJing. The introduction of ‘Beat-gridding’ removed the need for timing skills (the original essence of DJ’ing), however this freed up some space for other creative actions. Loops and effects became the next big DJ skill to refine. DJ sets started becoming more of a mash-up style with people cramming more tracks into their sets. The methods of control moved on from simple turntable control to more button pushing. Now with the introduction of Remix Decks, the humble, yet skilled, DJ can now become a live producer, mixing loops and effects in real time. With the option of playing 16 channels at once, each channel playing 16 loops or sounds through Traktors’ remix decks, the DJ has an entire spaceship worth of controls to consider. Not to mention the possibility of layering the potential of 12 effects into the mix using traktors’ in line effects units. Should one feel that ones’ skill level is still not being tested enough, this can all still be combined with the use of classic turntable control, just to make sure every part of your brain is being used! Mapping controls is not that difficult, but it certainly takes time. The best way to learn, like everything, is to try it. I would recommend saving your current settings before you start to play about with midi maps, so that you have a template to revert to should you make some mistakes. There are a number of ways to do this, but I will explain the safest way for you here. Now you can scroll into the Assignment Table – here you can see what hot keys are already assigned. As it can be quite the task to scan through, we will just go ahead and create a new assignment. 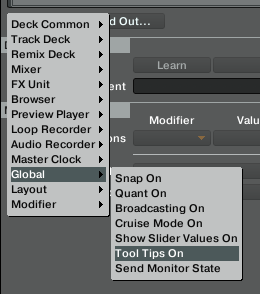 Select ‘Add in…’ – I want to add the ‘Tool Tips’ function as a hot key. Press the ‘T’ key – and hey presto the T is assigned to tool tips. Hang on though!!! – We need to check if that key is already assigned. Making sure that the new Tool Tips assignment is highlighted in yellow, scroll up through the other assignments – If you are using the default settings you will notice that another item higher up, ‘Tempo Band Deck A’ is also highlighted – This means this key is already assigned. You can either pick another key, repeating the process until you find a key not in use, or if you feel you will not use the pre-assigned function of the ‘T’ key, then you can delete the original. Delete original: Highlight the Tempo Bend function that already has the ‘T’ assigned to it and simply press the Delete button that sits immediately under the assignment Table. 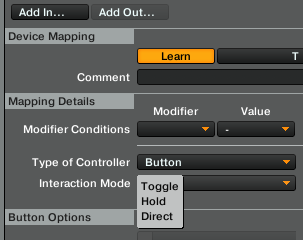 For this particular function – I would recommend you select the ‘Toggle’ option as this will toggle it between on and off. Pressing it once for on and again for off. You can select ‘hold’ if you would prefer. This obviously means that you will have to hold down the ‘T’ to see the tool tips. It is entirely down to your own preference. Congratulations – you have now made your first key assignment. This process is the same for all functions, be it for keyboard assignments of controller assignments. 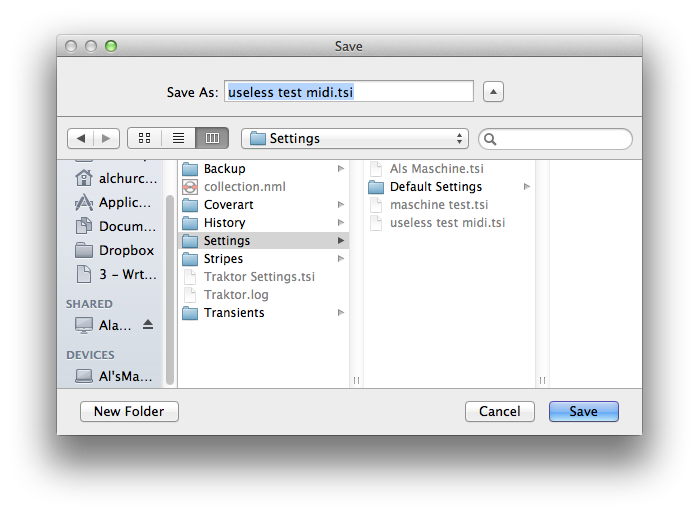 If you would rather not mess with the existing settings, you can create a new template altogether. To do this, simple select ‘Add’ underneath the Device and navigate to a pre-set tsi. 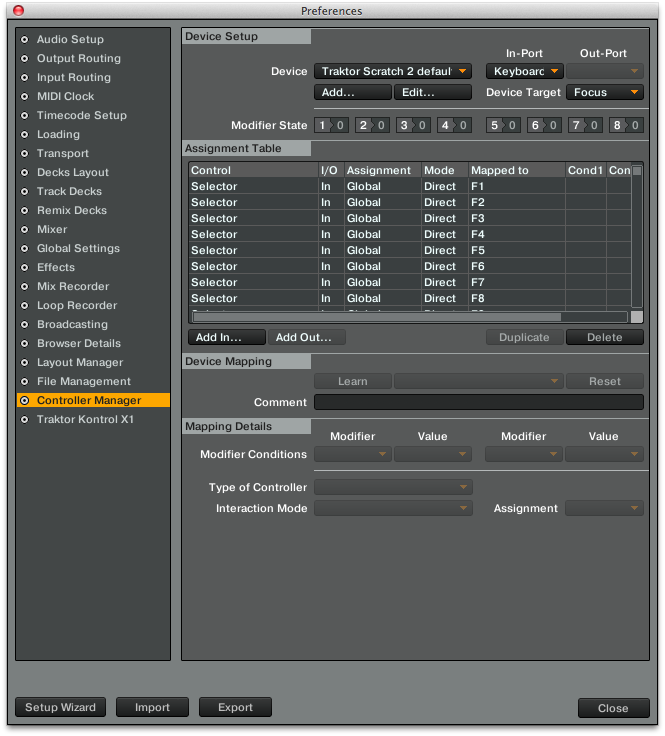 You can then import a pre-saved tsi or select ‘Generic Midi’ or ‘Generic Keyboard’. This will create a completely new Device that you can adjust and mess about with until your hearts content. If you do this however, you may get some overlap or duplicate midi settings between devices. For instance, maybe you are setting up a Maschine to control Midi, but you already have an X1 set up. You have to be careful that you don’t select a midi note (or signal) on the Maschine that performs a function that is already assigned to the X1 on the other device assignment table page. A google search should turn up a bunch of pre-set tsi files that may be suitable for your workflow, you can download these and import them they way I explain above, but I feel that due to such different workflows that DJ’s may see more value in making your own. This way you not only get to learn the program more, but you really start to think about how you perform and what you want to achieve. If you have any questions or even have some tsi files you want to share with others, feel free to use the comments section on this page. I would love to hear feedback from the readers of Traktortips. Thank You. I am searching all over the internet for pre-built Kontrol S4 MIDI (not NHL) mappings to import into controller manager that work in MIDI mode… Do you know of any? Thanks for the great site! I’m not sure what kind of mapping you mean?